Imperial Japanese Army Page. Fair use may apply. 511'10" by 62'4" by 26'9"
The Shinshu Maru was the world's first amphibious assault ship designed as such. Completed in 1935, she was built in great secrecy, and generally sailed under a false name (Ryujo Maru or Fuso Maru.) Landing craft could be launched from stern doors or lifted out of the forward hatch with a crane. The Navy took over the ship from the Army during construction and designated it a landing craft depot ship. The ship was originally equipped with an aircraft hangar and two catapults and was designed to carry 26 small seaplanes. 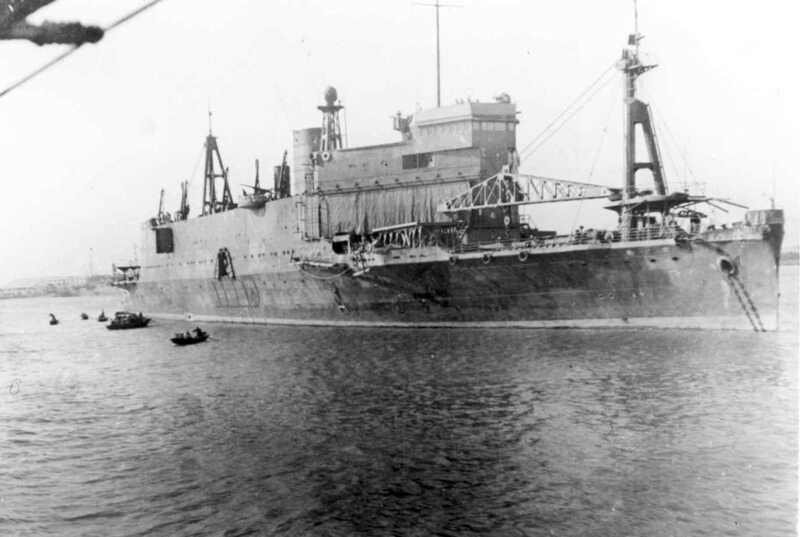 However, the catapults were removed before the ship was completed, and she never carried any seaplanes operationally. Shinshu Maru was likely part of the Singora Attack Force, sailing under the name Ryujo Maru. She also saw service in the invasion of Java, where she was accidentally sunk by friendly fire during the battle of Bantam Bay. Raised and repaired, she was torpedoed and badly damaged on 3 January 1945 between Manila and Takao, sinking two days later. Note that the name Shiushu Maru given for this class in Jentschura, Jung, and Mickel is probably a misprint.